If you visited Suntec City recently then you would probably agree that the whole area is turning into a F&B haven given the number of restaurants that the mall welcomes. Not only do we see a flux of new restaurant concepts but even the older restaurants in the area are going through a facelift such as Kuishin Bo located just next to Sumiya. 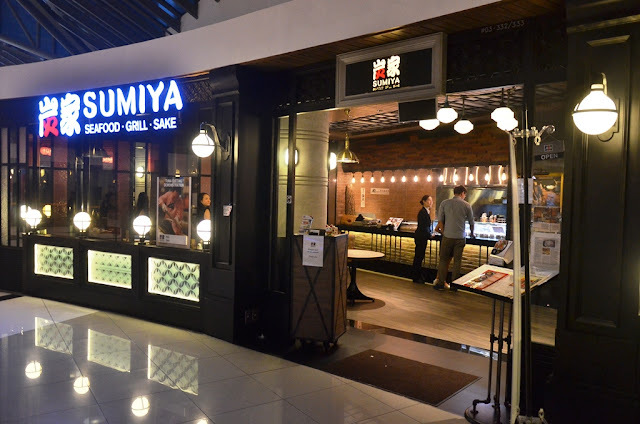 With a name that spells charcoal house in Japanese, it is no wonder that Sumiya's speciality lies in charcoal-grilled food. 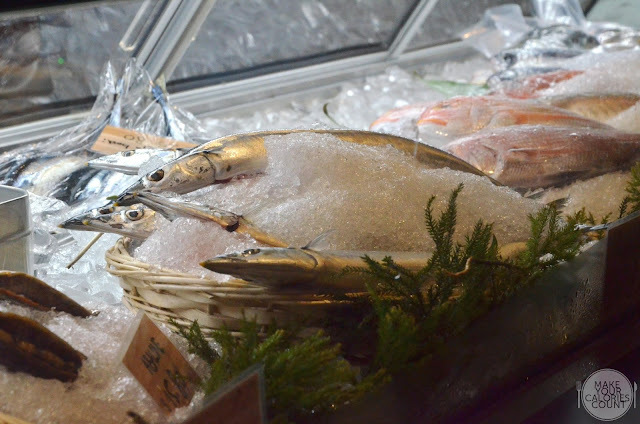 For seafood lovers, it would be a haven given the variety of selection which are mostly air-flown to Singapore at least thrice a week from Japan. 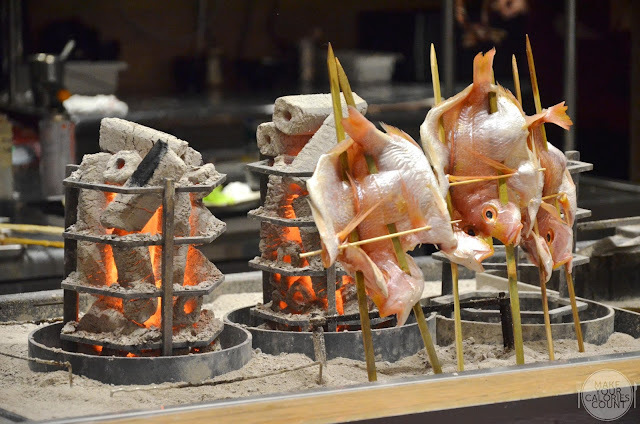 Given that seafood anchors the offering of the restaurant, Sumiya differentiates with unique cooking methods such as its irori genshiyaki (charcoal-grilling). 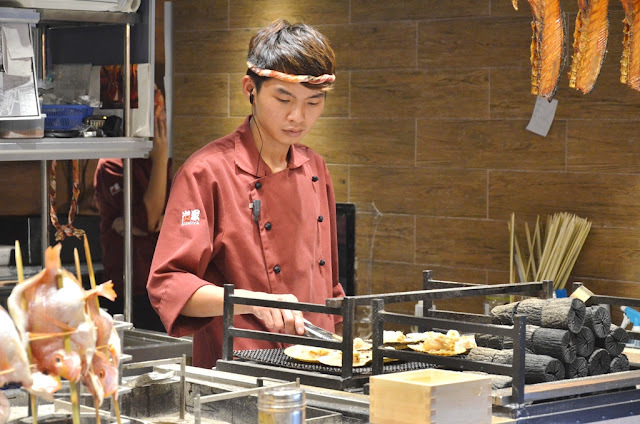 Being one of the highlights of the restaurant, you will see the chefs at work as you step in. This technique allows a beautiful layer of smoky char on the seafood while preserving the succulence of the ingredients. 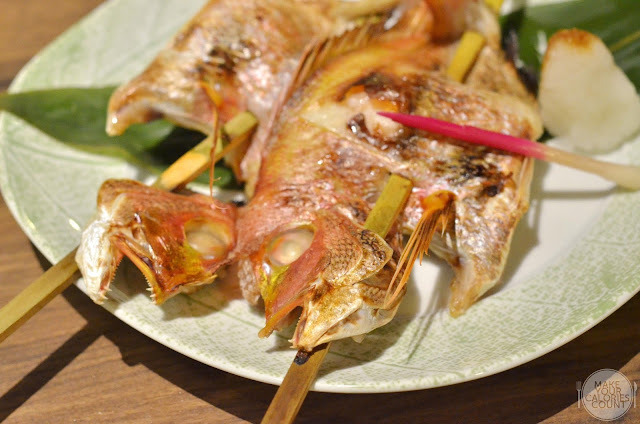 The whole fish or selected fish parts for instance would be skewered and slow-grilled vertically around a stack of smouldering charcoal and cooking time can take anything from 20 to 40 minutes. In the meantime, do try some of the starters! It is one of those occasions where the food served looked exactly like how I visualised it to be when I read it off the menu. 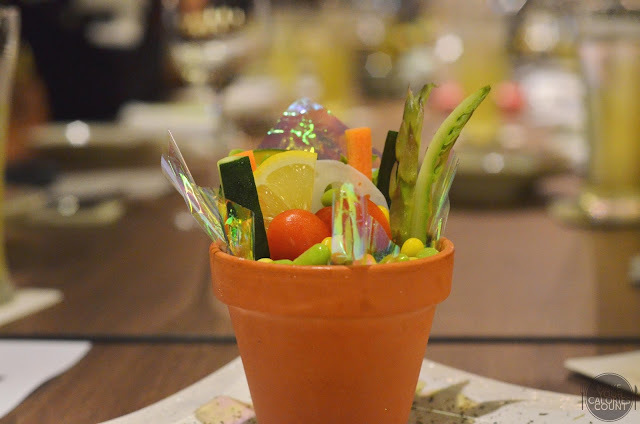 Presented elegantly in a ceramic pot, the salad looked like an assemble from our garden indeed! 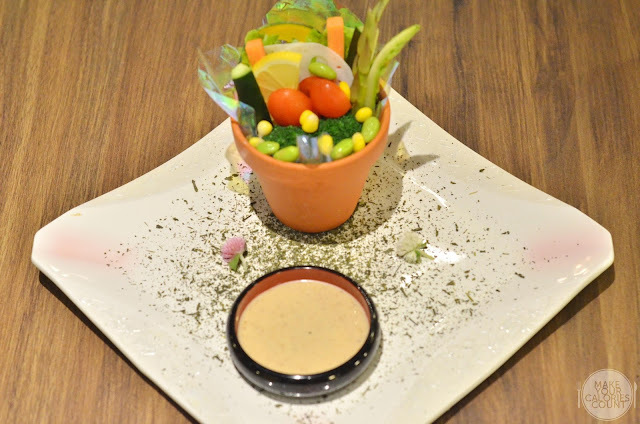 With an assortment of fresh vegetables, crab stick, flying fish roe and potato salad, one can choose to enjoy it with a yuzu soy sauce or creamy sesame dressing. Go for the latter and it would not disappoint as it went beautifully well with the mashy potato salad that hit just the right notes for us. I definitely love my sashimi and it was impossible to resist a platter as such. 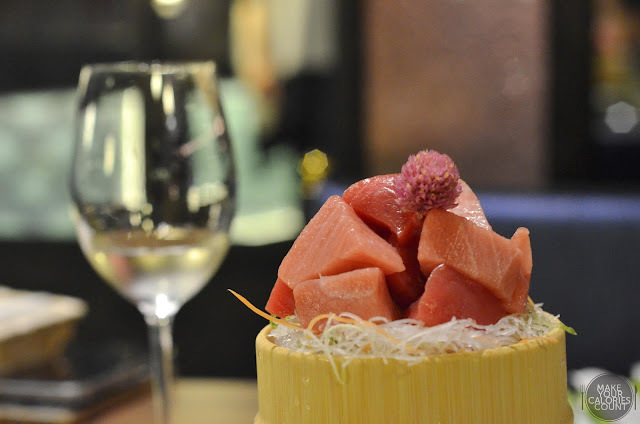 With three cuts from the prized bluefin tuna, expect to indulge in the ootoro (fatty tuna belly), chutoro (medium fat tuna) and lastly akami (lean tuna). You can differentiate the three by their hues with the lean tuna being richest in colour and the fatty tuna bearing the lightest shade. As much as I love my waistline, I got to admit that the melt-in-your-mouth ootoro was my clear favourite. 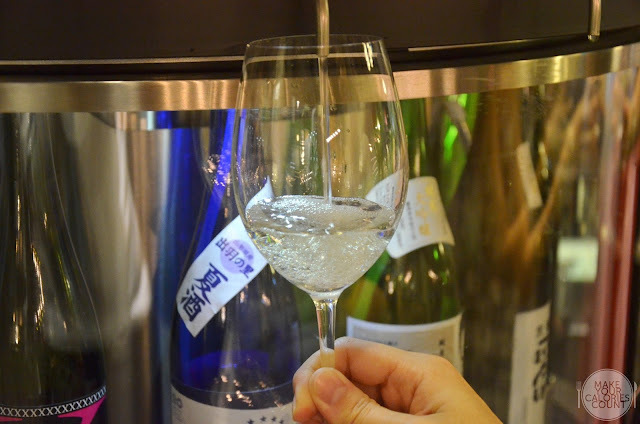 If you enjoy a wine-pairing for your food, do ask for recommendations on sake-pairing for your sashimi or grills as the restaurant has an in-house certified sake sommelier will take care of your needs. Incidentally, I caught one of the chefs at work as he worked towards preparing a sashimi platter for diners on another table! The half-shell scallops served here would not disappoint and if you have some business associates that you would like to impress, be sure to order this. 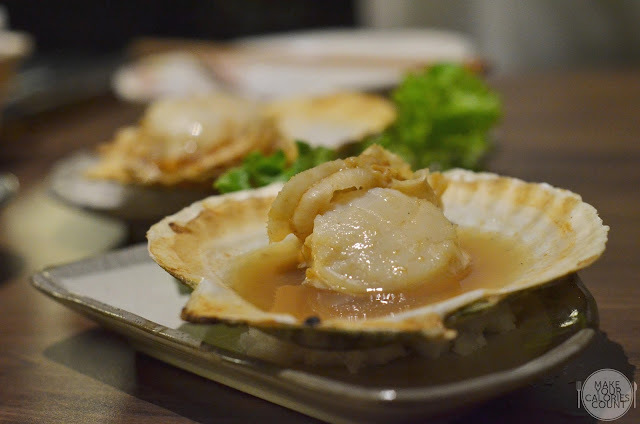 Char-grilled to perfection with soy sauce dashi broth, the scallop was fresh, succulent and cooked perfectly. If you are not too tolerant towards salty broths, you might find it slightly too strong but for those looking for a strong flavour, this would fit the bill. 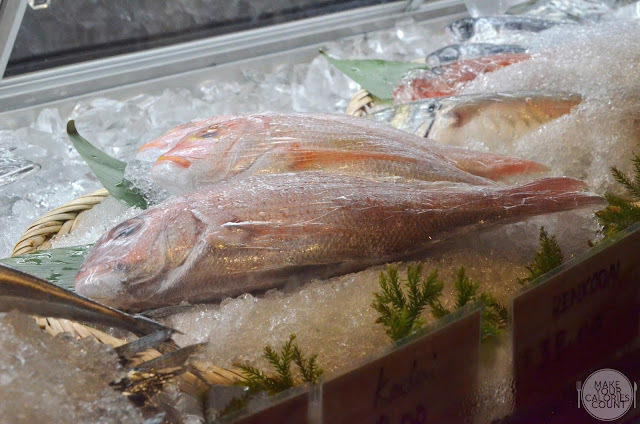 When it comes to the selection of fish, do check with the servers on the seasonal specials or catch of the day as it is subjected to availability. The Renkodai is a type of sea bream and while it tasted great, do watch out for the tiny bones so for the parents, do keep a look out for your kids. With a drying machine in-house, it helps to control the temperature at 30 degrees Celsius with a heat that replicates the warm of typical sun rays. This process helps to intensify the natural flavours of the fish just like how sun-dried tomatoes would compare with normal tomatoes. Dried with a proprietary marinade before char-grilling it, the desired taste would be imparted on the selected catch. Perhaps I was expecting a stronger differentiation with an additional cooking technique, I was rather unimpressed with the taste. While the drying machine was supposed to extract the natural flavours of the fish, it came across rather and this could perhaps be a choice of the fish. A classic that one cannot go wrong, this dish fondly reminded me of my dining experience at Nobu InterContinental Hotel in Hong Kong where the quality was on par. Char-grilled to perfection again like its other dishes, I particularly enjoyed the crisp skin that was a collective result of the grill and the salt that was carefully massaged onto the yellowtail collar, extracting the moisture to the surface. This however did not compromise the underlying flesh as the naturally oily fish made sure that it tasted succulent. Have it with a dash of the finely grated dashi and you have a star dish. 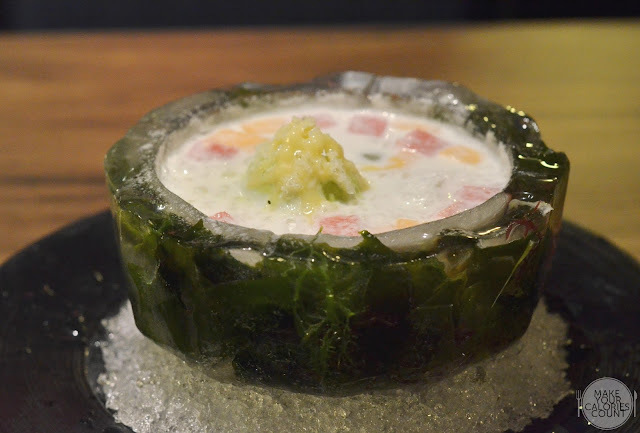 Also known as the Can Can Mushi, this hotpot dish was inspired by the way Japanese fishermen cook freshly caught seafood in a tin can on the board or on shore. 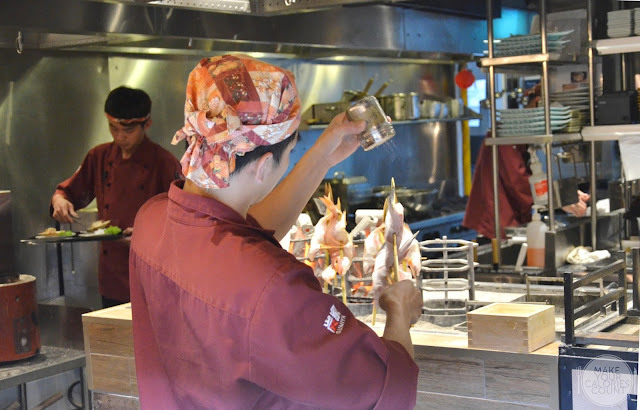 In Singapore, we obviously have it done in a slightly more sophisticated manner and we have a specially designed aluminium tin cooked over a table-top stove. Depending on the customisation of the seafood by the diners or the chef, the price of the dish may vary but if you need some numbers, the soup base is a standard charge of S$6 and you have a choice between clear broth, tom yum or the must-try soy sauce and miso-based soup with garlic and chilli. I say it is a must-try because I had not one, not two but three servings. The balance in flavours was spot-on, a hint of salinity that gave the oomph and the after-taste was matched by a growing heat from the chilli padi added. 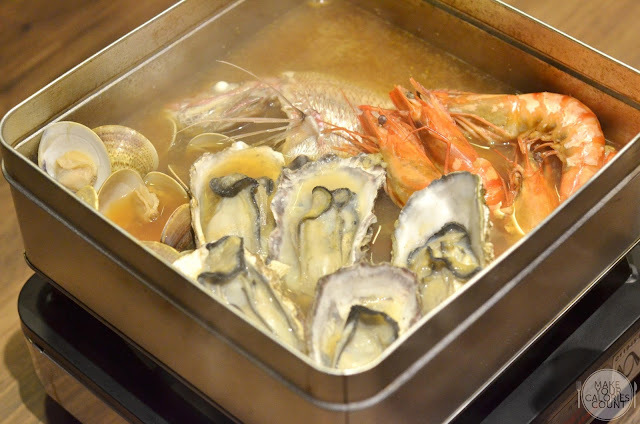 I suggest having the prawns (S$5/pc) , oysters (S$4/pc) and Hamaguri clams (S$3/3pcs) but do be careful not to leave the fresh seafood in the broth for too long as it will overcook them. With a presentation that would wow your guests, the hand-carved ice bowl comes in limited quantities. 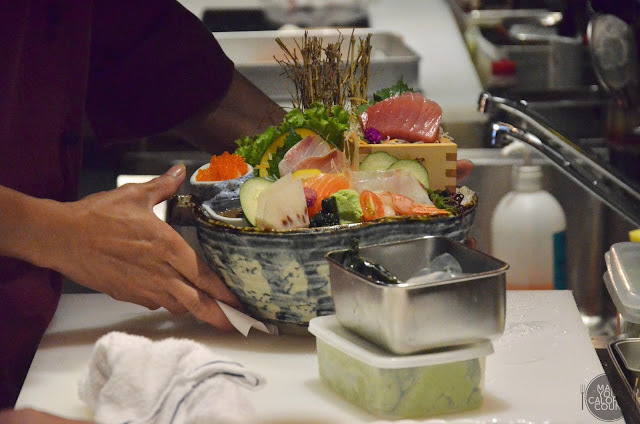 If you look at the bowl closely, you would find it being crafted with just ice and seaweed! While it was melting when we indulged on it, don't worry, you will have enough time to finish it before it becomes a mess on the table! 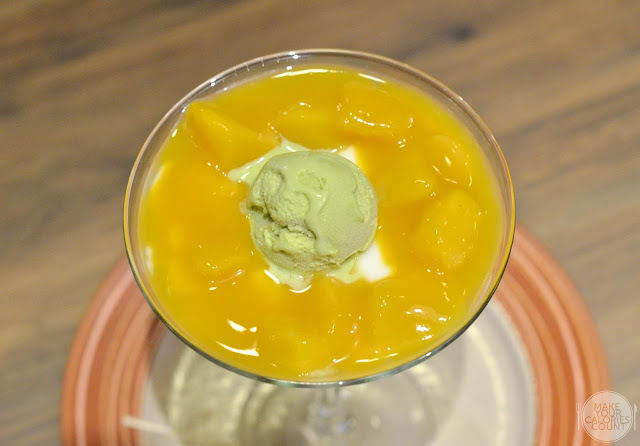 Tasting like our more familiar local favourite Bobo Chacha, this is the Japanese rendition with cubes of mango, watermelon, rock melon, sago, green tea ice cream and red bean paste in coconut milk sauce. With chunks of mango and green tea ice cream in a creamy yoghurt, the tang was a little too much for my preference on the first spoonful but subsequent servings went surprisingly well. 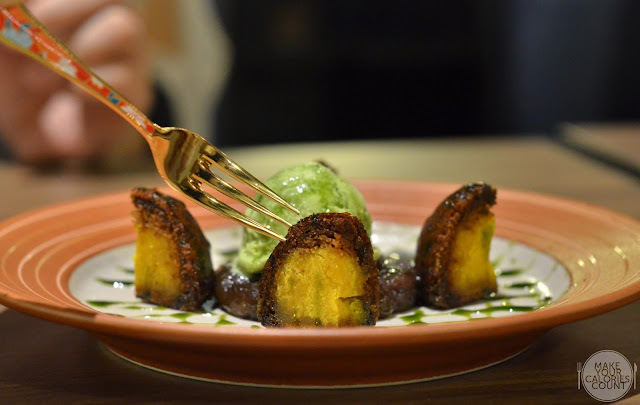 My favourite dessert among the lot, the crispy deep-fried Japanese cake was stuffed with pumpkin, served with green tea ice cream and sweet red bean paste. I loved the variation in textures from the crispy cake to the mashy pumpkin and ice cream that melted in my mouth. The sweetness was enough to please, just shy of satiating your appetite. 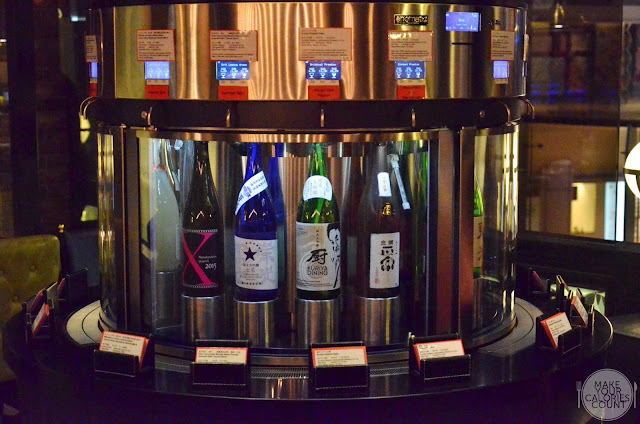 As mentioned earlier, one of the key highlights at Sumiya is the offering of a circular Enomatic sake dispenser which is probably the first and only so far in Singapore. 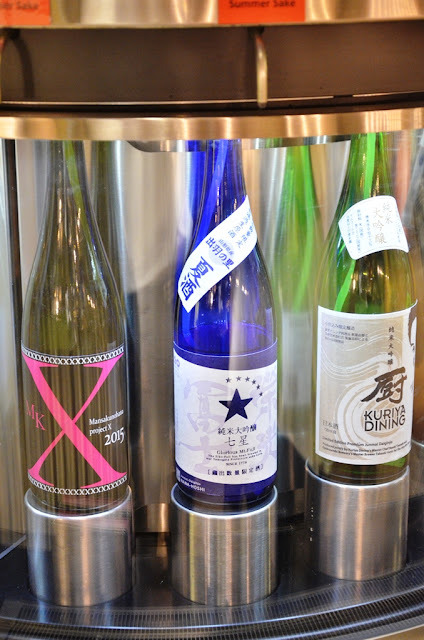 Displaying up to 16 different types of sake ranging from light easy-to-drink brews to premium full-bodied versions, diners have the luxury of tasting them in smaller portions (20ml/glass) before deciding on the preferred version for a half glass (60ml) or full portion (120ml). 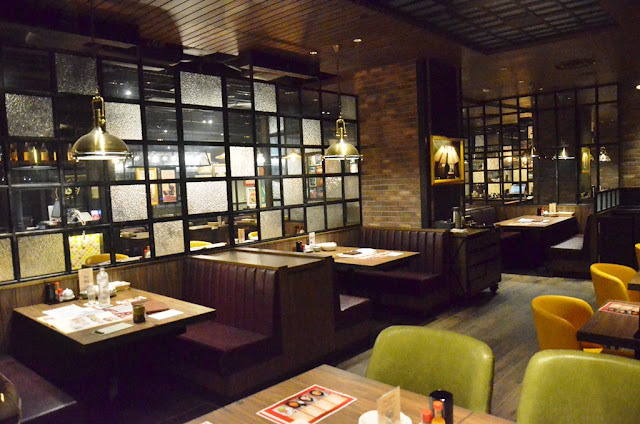 This allows diners the flexibility to sample various types of sake, particularly with the seasonal specials! Prices start from S$2.20/++ per glass. 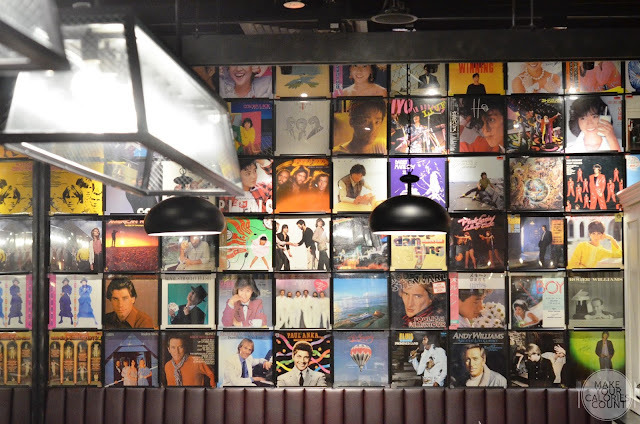 With different types of seating arrangement to cater for families, business functions or simply get-together with friends, we were particularly attracted by this wall lined full of old records specially imported from Japan! 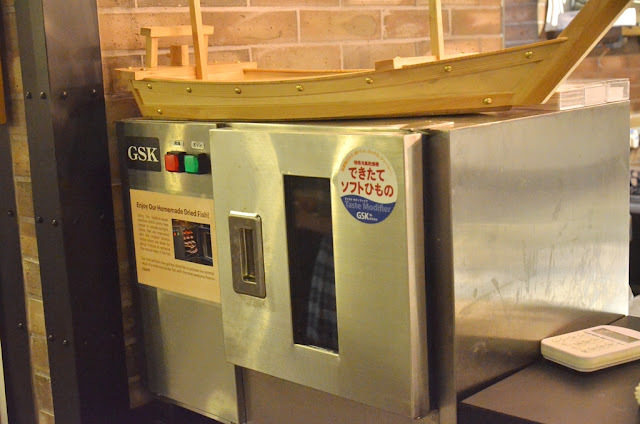 In terms of service, it is arguably true that Japanese restaurants typically ensure that their servers give nothing but the best and we later learnt that the manager give a run-down to make sure everyone learns how to greet guests in Japanese. Overall, it was a good dining experience and with quality comes price. The air-flown quality seafood can also be enjoyed in Sumiya's latest sake-pairing 5-course menu offered at S$68.80/++ per person. 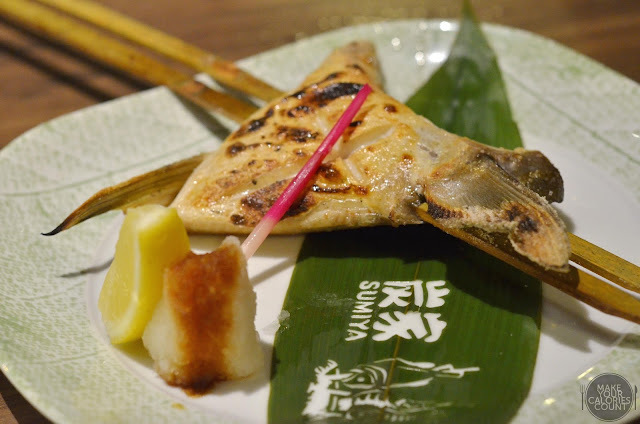 We would definitely return for the Ryoshi Mushi, sashimi and also to try out other types of sake!